Time trialling is the ‘race of truth’. A pre-designated course is followed, riders are set off usually at 1 minute intervals. The rest is up to you! Complete the course as fast as you can and see how you compare against your previous times as well as the other riders. Why should you time trial? Time trialing is different to road, circuit or track racing, it is a test of your ability alone against the clock. Trialers are set off a typically 1 minute intervals. No mates to draft (unless you’re riding as 2 up) and no tea shops to take a rest at. If you start on the short courses (10 miles or less) they’ll typically only take 30 minutes to complete – after which you can retire to the head quarters for a well earned tea and cake! It’s a good way to test yourself. Don’t think you have to be a racing snake to enter either, take a look at the HRC evening events. There are three types of events for time trialing, club events, interclub events and open events. HRC run their main events on a Tuesday evening starting in April through to mid August. These are open to allcomers, if you’re not a member of a club then you’re welcome to “Come and Try” and see if TTing is for you. The main courses are P841 and P843, with the Head Quarters at Westbourne Scout Hut, the course itself starts at Churchers Corner – a layby north of Westbourne just east from where Foxbury Lane joins the common road. There the course runs along the “back road” through to Chichester, down St Pauls road to Northgate roundabout (the one with the firestation on it) – from there, the courses differ. P841 goes right round the roundabout and back up St Pauls road to follow the back road through to just beyond East Ashling – finishing just beyond Southbrook road – opposite the old scout hut now called the Time Machine. P843 takes the first exit of Northgate roundabout up Broyle Road (A286) and continues through to Lavant where, opposite the church as the road goes to the right you take a left onto Downs road towards West Stoke. From there it is just a short way to the finish outside West Stoke Village Hall. As expected, the courses are “Segments” on Strava – P841 and P843. If you are new to all this and want to come and try, turn up early and talk to the organisers who will be happy to help you. Hampshire Road Club is part of the Portsdown Time Trial League (PTTL) – A season long series of races between seven participating clubs run on sporting courses – the purpose being to move away from flat roads and dual carriageways with busy traffic.The clubs compete in both individual and combined (top 5 riders from each club) points leagues – and Hampshire Road Club last won the group league in 2015. 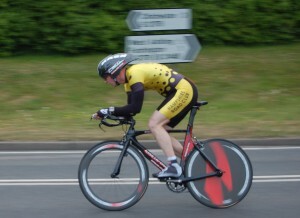 Open events are run by many clubs throughout the country and frequently involve some of the country’s finest time-triallists. Entry must be done online or by post beforehand and most events have a closing date approximately 2 weeks before the event. Details of the events can be found on the CTT website and the entry form can be found here. Hampshire Road Club advises all riders to wear a suitable helmet and have a flashing or constant rear light. Points will be awarded as Table 1 if there are 4 or more HRC riders in an event. Events receiving more than 10 entries from HRC members will be awarded points as Table 2. Events receiving insufficient entries to constitute a proper awardable event will be run as private time trials. The 12 hr and 100 mile events will be deemed proper awardable events for any number of entrants from the club.